The Hollywood Chamber of Commerce proudly honored actor Dwayne Johnson with the 2,624th star on the Hollywood Walk of Fame on Wednesday, December 13th, at 11:30 a.m. PST. The star was dedicated in front of hundreds of excited fans in the category of Motion Pictures at 6801 Hollywood Boulevard in front of Hollywood & Highland. His star is next to the stars of Vince McMahon and Kermit the Frog! “Everyone loves Dwayne Johnson! We predict that his star will be a very popular one to visit on our famous walk. Not only does Dwayne have a great personality and talent, but he also does a great amount of philanthropic work which is part of the criteria for earning an immortal spot on the Walk of Fame. We envision scores of photos being taken at his star by his fans,” stated Ana Martinez, Producer of the Walk of Fame ceremonies. With film revenues exceeding $2-billion worldwide, Dwayne Johnson has solidified himself as a global box-office powerhouse in both film and television. Always adding to his busy schedule, Johnson shows no sign of slowing down. He will soon be seen in Sony’s highly anticipated “Jumanji: Welcome to the Jungle” alongside Kevin Hart and Jack Black in theaters December 20th. Johnson recently wrapped New Line Cinema’s “Rampage” set to be released April 20, 2018 as well as Legendary’s “Skyscraper” set to be released in July 2018. Next year, he will star in Disney’s “Jungle Cruise,” based on its hit theme park ride. This past year, Johnson starred in Paramount’s “Baywatch” and Universal Pictures’ “The Fate of the Furious,” the 8th installment of the successful ‘Fast and Furious’ franchise. In 2019, Johnson will star with Jason Statham in a ‘Fast and Furious’ spin-off movie based on his breakout character Hobbs. Adding to a slew of tent-pole films, Johnson starred in the highest grossing live action comedy, “Central Intelligence” opposite Kevin Hart for New Line Cinema and also lent his voice to the widely successful Disney Animated film “Moana” released in November 2016. Johnson starred in the 2015 summer blockbuster “San Andreas” (New Line Cinema in association with Roadshow Pictures) as well which is set to feature a sequel. Among Johnson’s recent film credits are: Universal’s “Furious 7,” Paramount’s “Hercules,” the dramatic thriller “Snitch,” the comic book action-adventure “G.I. Joe: Retaliation,” the dramatic independent film “Empire State,” “Pain & Gain,” alongside Mark Wahlberg, “Fast 5” and “Fast and Furious 6,” which grossed a combined for $1.4-billion globally. Johnson’s previous films include “Race to Witch Mountain,” “Get Smart,” “The Game Plan,” “Journey 2: The Mysterious Island,” which grossed over $325-million in 2011, “Be Cool,” MGM’s sequel to “Get Shorty,” the 2004 remake “Walking Tall” and Universal’s “The Rundown.” Johnson was cast by Stephen Sommers in “The Mummy Returns,” which grossed more than $400-million worldwide. His role was so well received by Universal’s executives that they immediately planned a film based on his character, “The Scorpion King,” which broke box office records in 2002. Johnson’s production company, Seven Bucks Productions, co-founded with by his business partner Dany Garcia, has produced several shows, including HBO’s highest rated half-hour comedy “Ballers” starring Johnson and entering its 4th season in 2018. In 2017, Seven Bucks produced the critically-acclaimed “Soundtracks” on CNN, the science fiction action drama “Lifeline” on YouTube Red, as well as the youth prison documentary, “Rock and a Hard Place,” for HBO which became the network’s #1 watched standalone special. Seven Bucks also teamed with filmmaker Andrew Jenks to produce the podcast “What Really Happened” which recently hit #1 on iTunes’ Podcast charts. Born in San Francisco and raised in Hawaii, Johnson excelled as a high school All-American and subsequently as a star defensive lineman for the University of Miami Hurricanes, helping lead his team to a national championship. Upon graduating from the University of Miami, Johnson followed in the footsteps of his WWE Hall of Fame father, Rocky Johnson, and grandfather, High Chief Peter Maivia, by joining the competitive sports entertainment world of the WWE. Within a seven-year period (1996-2003), his intense passion led to an extraordinarily successful career breaking box office attendance records across the U.S. and setting pay-per-view buy rate records during that period as well. As “The Rock”, a larger than life extension of himself, Johnson became one of the most charismatic and dynamic characters the industry has ever seen. In March 2012, Johnson made a record-breaking return to the WWE where he defeated John Cena to become WWE Champion in the main event of at Wrestle Mania XXVIII in Miami. Known as “The People’s Champion” in WWE, Johnson takes tremendous pride in the relationship he has with his audience, feeding off their passion and connectivity. Johnson regularly engages his over 175 million followers across social media as well as his YouTube Channel and was ranked #1 on Hollywood Reporter’s “Top Actors” chart which ranks analytics for Facebook, Instagram, Twitter, YouTube and Google Plus. 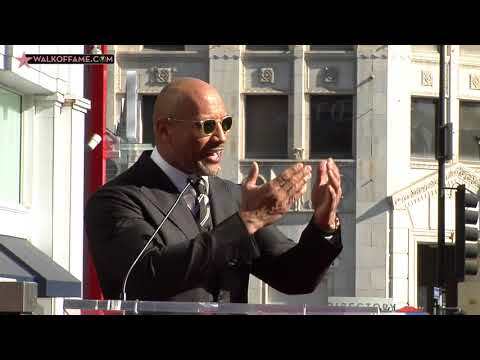 Johnson penned an autobiography, The Rock Says, which reached #1 on the New York Times Bestseller List shortly after its publication in January 2000. Johnson also created The Rock Foundation in 2006, with a mission to educate, empower and motivate children worldwide through health and physical fitness. A dedicated philanthropist, Johnson is the current National spokesperson for the Entertainment Industry Foundation’s Diabetes Awareness Campaign. He is also a committed Celebrity Cabinet Member for The American Red Cross, and serves as a National Celebrity Wish Ambassador for The Make-A-Wish Foundation. In 2008, United States Congress and the United States Joint Leadership Commission recognized Johnson with the prestigious Horizon Award, the U.S. Congressional Award given to an individual in the private sector who has demonstrated outstanding leadership and provided opportunities for youth nationwide.